Those who know and love me, along with those who have read my series on scleral lenses, have some idea of how much they improve the quality of my life. To go from putting up with ointment-smeared blurry vision to avoid dry-eye pain to clear and usually comfortable vision was nothing short of miraculous. Sclerals rock! I first heard about LaserFit lenses when Dr. Greg Gemoules commented on one of my web posts. The best way to learn about LaserFit is to poke around his website, but in short, rather than relying on hit-and-miss trial lenses, Dr. G uses computers to precisely measure the surface of each eye to design customized non-rotational lenses. I was intrigued by the concept of computer-designed customized lenses, but at the time I could not justify the trip. It remained in the back of my mind as a possibility, however, and late last year a number of variables fell into alignment, allowing me to schedule an appointment. The most difficult part of the process was not wearing my prior set of scleral lenses for a week leading up to my initial appointment with Dr. Gemoules. Because the surface of the eye is malleable, this period of rest is essential to the best fit. Despite the discomfort at work and on the flight, I made it through. Coppell Family Eye Care has a medical rate arrangement with a local motel that supplies a shuttle service to the airport, eye clinic, and other attractions within a three-mile radius, including nearby Grapevine, Texas. The Monday appointment is the longest at about two hours, during which Dr. G does a comprehensive eye exam and takes the digital measurements to design a first set of lenses. The staff carefully schedules LaserFit patients so that each one is allotted sufficient time for a successful outcome. Patients come from all over the United States and worldwide – there was a young man from China visiting the same week that I did. Custom made lenses arrive from the lab by about 2:00 p.m. the next afternoon. For the remainder of the week, Dr. G checks visual acuity and the fit of the lenses during follow-up visits that last about half an hour. In my case, the fit of the first lenses was excellent, but needed some adjustment for sharper vision. Each subsequent set of lenses improved my distance vision. By mid-week, Dr. G experimented on designing multifocal LaserFit lenses since that was what I was used to with my prior scleral lenses. Unfortunately the multifocal aspect came at the expense of distance acuity, so we reluctantly gave up on the idea. Dr. G had warned me from the outset that I would lose near vision, but I had not expected the change to be so dramatic. He suggested trying monovision (one lens designed for distance and one for near vision) but just as when I had LASIK surgery, I prefer to have both eyes corrected for distance. After trying and rejecting various types of over-the-counter readers, I eventually bought a pair of glasses with progressive lenses that have no distance correction for wearing at work. 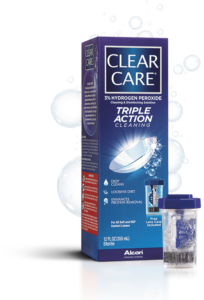 Dr. G recommends a different care routine than I was using for my previous scleral lenses. 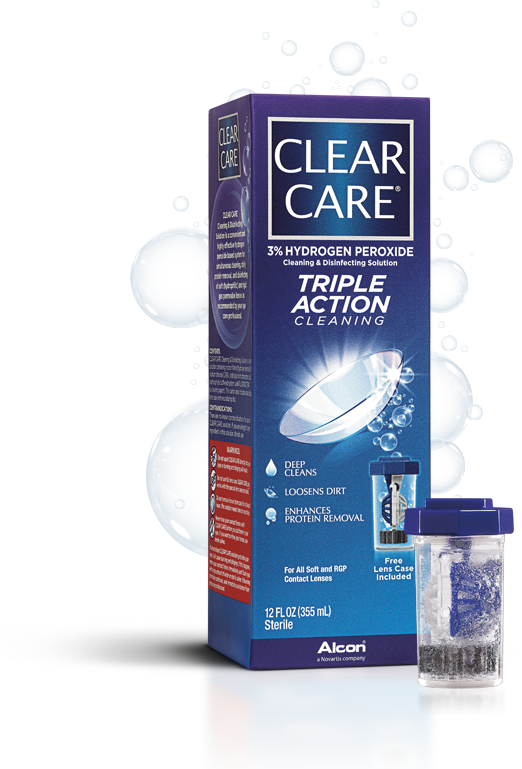 He prefers Clear Care® hydrogen peroxide solution (although not Clear Care Plus®). LaserFit lenses are larger than the maximum recommended for the Clear Care® case, but carefully centering the lens in the basket enables its use. Do be very careful, though, not to let the lens basket snap shut as this can cause the lens to snap as well. Because LaserFit lenses are designed to exactly follow the contour of the eye, they do not rely on suction and are therefore much easier to remove. It’s very very important to check with your vision insurance before booking an appointment. VSP, for example, pays hardly anything toward the lenses or the exam. Updated lenses may be over-refracted by another eye care professional (I am less than a year out and have not done this yet). Despite the time and expense, and even though I was relatively successful with rotational scleral lenses, I would do LaserFit again in a heartbeat. Sclerals rock, and Dr. G is a rock star!